One of the first humans to inhabit the Americas has been stolen – and archaeologists want it back. The skeleton, which is probably at least 10,000 years old, has disappeared from a cenote, or underground water reservoir, in Mexico's Yucatán Peninsula. In response, the National Institute of Anthropology and History (INAH) in Mexico City has placed "wanted" posters in supermarkets, bakeries and dive shops in and around the nearby town of Tulum. They are also considering legal action to recover the remains. The missing bones belong to a skeleton dubbed Young Man of Chan Hol II, discovered in 2010. The cenote in which it was found had previously yielded another 10,000-year-old skeleton – the Young Man of Chan Hol, discovered in 2006. The earlier find has anatomical features suggesting shared heritage with Indonesians and south Asians. 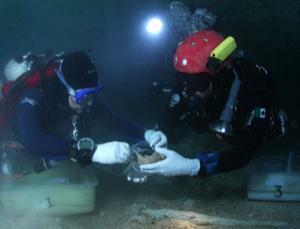 Other skeletons found in cenotes in the area with similar features may date to around 14,000 years ago. Such finds imply that not all early Americans came from north Asia. This deals yet another blow to the idea that the Clovis people crossing an ancient land bridge between Siberia and Alaska were the first to colonise the Americas. Clovis culture dates to around 13,000 years ago. Both skeletons were laid to rest at a time when sea level was much lower than it is today and the cenote, now about 8 metres below the water, was dry. Archaeologists have also found the remains of elephants, giant sloths and other animals in the caves, giving an indication of what the ancient humans ate. INAH researchers have been aware of creeping theft of specimens from cenotes, but they lack the resources to guard the hundreds of sites that dot the peninsula.